Liquid is the way to go for your next PCT. Make sure you get the good stuff. AIs of good quality are hard to find. Aromatase inhibitors play a key role when it comes to successfully achieving your post cycle therapy (PCT) goals. Besides helping stave off the estrogen levels in your body from going off the charts, aromatase inhibitors also prevent the synthesis of androgens like testosterone into estrogen. Make sure you follow along why you need to consider including aromatase inhibitors in your post cycle therapy plan to really get the results that you want. However, before we discuss this in detail, let me give you a quick rundown on what a post cycle therapy is and why it is very important after “cycling” with anabolic steroids and pro-hormones to help you understand the whole thing better. So What is Post Cycle Therapy? Post cycle therapy can be simply described as a process that involves specific compounds, nutrition and pharmaceutical products that help regulate estrogen levels in your body. There is usually an imbalance of hormones in your system that takes place after you go through a cycle of pro-hormones and anabolic steroids. While your body has the natural ability to bring back its hormones to ideal levels, it can take a very long time to achieve this. And you will only become extremely vulnerable to a number of adverse effects that can significantly affect your bodybuilding goals the longer this process takes. When you don’t have a proper PCT plan set up, you are exposing yourself to key issues that are not just detrimental to your overall health, but will also prevent you from achieving the results in your bodybuilding checklist that you’ve always wanted. Aside from being prone to “gyno” or developing gynecomastia, which is a disorder that causes the enlargement of a man’s breasts, you are also at risk of spiking blood pressure levels as well as increased water retention in your system. 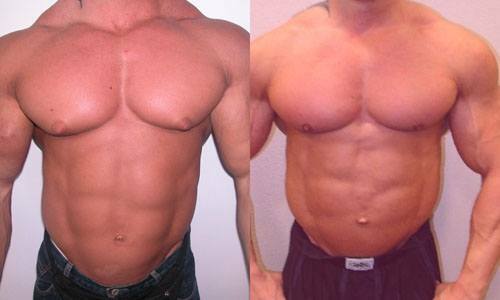 The development of “gyno” or gynecomastia after cycling with anabolic steroids and pro-hormones without a proper post cycle therapy. When this happens, your body will progressively take on a smoother contour that will simply make you lose a lot or even all the gains that you’ve worked really hard for. Now we’ve already got that covered, let’s take a look at the role of aromatase inhibitors in post cycle therapy. Aromatase inhibitors are basically a specific class of pharmaceutical products that help pick up the pace in getting the results you want during post cycle therapy. They are designed to prevent your estrogen levels from going through the roof when your body is in the process of realigning its hormonal levels. 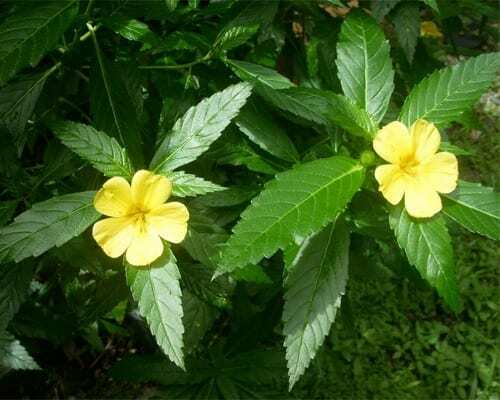 Interestingly, there is a type of plant called Turnera diffusa or the damania shrub that is seen to naturally produce aromatase inhibitors after being subjected to clinical studies. Turnera diffusa is endemic to the regions of the Caribbean, South and Central America as well as the southwestern parts of the United States. A flowering Turnera diffusa plant. The primary function of aromatase inhibitors is blocking a fat enzyme called aromatase that can transform other types of hormones in the body into estradiol, a type of estrogen, through a process called aromatization. As long as these aromatase enzymes are not regulated, the estrogen in your system will keep on shooting up, which also raises your risks of experiencing the adverse effects that we’ve touched on earlier. How testosterone is transformed to estrogen through the process of aromatization. There are two types of aromatase inhibitors that are commercially available these days. Besides being used for post cycle therapy, these medications are also utilized to treat breast cancer. 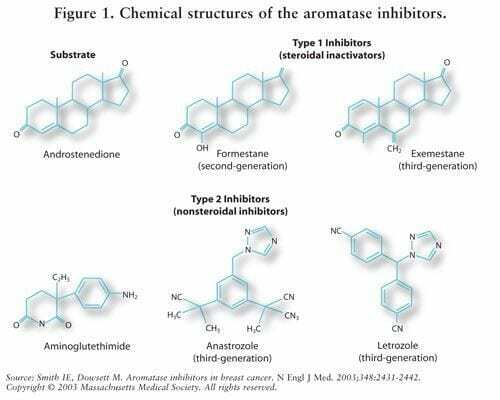 The chemical structures of aromatase inhibitors. The first type is the non-steroidal aromatase inhibitor that prevents the transformation of androgens like testosterone into estrogen via aromatization. Examples of this type of aromatase inhibitor include letrozole and anastrozole. The second type is the steroidal aromatase inhibitor that averts the process of aromatization by permanently shutting down the chemical bond that will take place during the same. An example of this type of aromatase inhibitor is exemestane. When you integrate aromatase inhibitors in your post cycle therapy program, you are simply helping your body boost its ability to bring back its ideal hormonal levels at a much faster rate by preventing it from producing excessive amounts of estrogen, which somehow accelerates the generation of testosterone. Apart from keeping you clear of the adverse effects of having too much estrogen like being prone to gyno and hypertension, you can also guarantee that you won’t be losing the gains that you’ve worked really hard for at the gym anytime soon when you load up on aromatase inhibitors in your PCT. Since the aromatase inhibitors you can get your hands on these days are artificially produced, you will tend to experience a few side effects when you use them during your post cycle therapy. However, this doesn't mean that you'll go through all of them though. There is a possibility that you will undergo stiffness and pain in the joints, particularly the knees, ankles and wrists when loading up on aromatase inhibitors. Based on some clinical studies, aromatase inhibitor intake can also cause discomfort in the hands, which can feel similar to the symptoms of carpal tunnel syndrome. However, scientific findings also show that aromatase inhibitors do not cause any type of muscle or joint damage at all. You will feel easily tired within the first few days of using aromatase inhibitors. This is the body’s natural reaction to the changing hormonal levels in your system and will taper off sooner or later. The intensity of the fatigue you will go through also depends on how low your testosterone levels are. The sudden increase of testosterone in the body with the use of aromatase inhibitors will slightly “shock” your neurocognitive capabilities for a very brief period of time. While the effects of this abrupt rise in testosterone aren’t that significant, you will tend to notice a subtle change or two in your attention span and ability to remember stuff temporarily. If you’re looking to get a PCT program going soon with aromatase inhibitors in your checklist, simply going for whatever stuff you come across the worldwide web won't successfully pull it off. You have to grab them from a very reliable online source like Napsgear to make sure that the aromatase inhibitors you'll get your hands on are really going to get the job done, aren't fake, or won't KILL YOU. And when it comes to picking the best aromatase inhibitors for your next post cycle therapy, you've got to check out letrozole and anastrozole since they haven't just already built a sizable fan base among dedicated bodybuilders and fitness enthusiasts worldwide these days, but I've also seen the best results when I used them for my PCT.